Every airline’s Web site has limitations and various quirks that annoy travelers — some offer odd routings when you search for flights, others show confusing or even misleading prices, and yet others try to get you to buy things you don’t need instead of taking you straight to the final purchase page. However, if you simply want to display your itinerary by providing your reservation or ticket number, no major carrier will fail you. Except US Airways. In the past couple of years, I’ve had several tickets with flights on that airline that its Web site was unable to find. Instead, it returned error messages asking me to call reservations. When I did, agents blamed the error on the fact that my tickets had been issued by a partner-carrier — in those cases, United Airlines. I remembered that, until about three years ago, I was able to retrieve United-issued tickets on US Airways’ site. But then I was told that, around that time, US Airways switched reservation systems, and the new one was causing the problem. You may wonder why it was important to me to access my itineraries on US Airways’ site when I could easily see them on United’s. Without that access, I can’t choose and change seats on US Airways flights or check in online, which makes a big difference to frequent fliers. In addition, the operating carrier’s site always has the most accurate schedule or other information about the flight. Even as I made peace with the inconvenient constraints, I kept hoping that US Airways will fix the problem. Not only did that never happen, but a couple of months ago, I made an even more troubling discovery. I booked “award” tickets with US Airways miles, which of course means they were issued by US Airways. But I was stunned to get that same error message when I tried retrieving the reservation. An agent on the phone attributed it to the fact that the itinerary included flights operated by partner-carriers — in that case, Air Canada and Germany’s Lufthansa. Those carriers, US Airways and United are all members of the global Star Alliance. So it appeared that the only time one can retrieve a ticket on US Airways’ site for sure is when it’s both issued by US Airways and there are no partner flights on it. I found it difficult to understand those conditions, given that it’s 2010, and with all the code-sharing and alliances in the industry, as well as the available technology, airlines book seats on each other’s flights all the time. 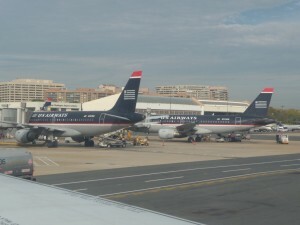 Last week, I asked US Airways spokeswoman Valerie Wunder whether the airline plans to improve the site’s capabilities. She wasn’t aware of the problem but quickly arranged a conference call with two of the carrier’s expert on the issues I raised. They said that the “award” tickets issued by US Airways I mentioned contained an airport code the site didn’t recognize, and that’s why it couldn’t find the reservation. Code-recognition problems apparently involve smaller foreign cities where US Airways doesn’t fly, but partners do, hence the inability to display some itineraries with partner flights. Instead of being standoffish and trying to persuade me that the problem is not big enough to warrant a column, which I’ve experienced in dealing with other airlines, US Airways was straightforward and honest. The experts thanked me for alerting them to those issues and agreed that they should be fixed. If access to seat maps and online check-in are conveniences one could live without, another consequence of the Web site’s failure to display certain reservations is an actual handicap. About a week ago, I was checking some Lufthansa inventory for another possible trip and discovered that one of the flights on those “award” tickets, on which travel begins in May, no longer exists. Had I not stumbled upon that information by accident, I would have never known. Even though the change had happened a month earlier, I didn’t receive a phone call or e-mail from US Airways — a standard industry practice — and of course, I couldn’t see the change on the Web site. The experts I spoke with said that US Airways has a timetable for notifying passengers of schedule changes just a few weeks before departure — not immediately, as does United, for example — to avoid multiple notifications if schedules are altered again. So I would have likely received word some time in April. I suppose that practice is less confusing for some travelers, but I’d rather know about any changes as soon as possible, so I can make alternative arrangements. This is crucial for mileage tickets, and especially when you need several seats on the same flights. As we all know, “award” availability is very difficult to come by these days, and the more time one has to look for seats, the better the chances of finding any. Air travel today is a long and complex chain of various operations and carriers, and it would help customers if airlines thought about the consequences of what might seem like a minor schedule change but could affect significantly a passenger’s travel plans. This entry was posted in Travel and tagged Air Canada, airlines, code-sharing, Germany, inventory, itineraries, Lufthansa, passengers, reservations, routing, schedules, Star Alliance, ticket, Travel, United Airlines, US Airways. Bookmark the permalink.